Schonstedt Instrument Company's GA72-Cd handheld magnetometer has been put on permanent display at UN Headquarters in New York, where some 1500 people per day tour the complex. The demining tool is the workhorse of United Nations humanitarian demining teams around the world. To date, Schonstedt and its customers have donated over 350 units for use in 21 countries where UXO clearance would not otherwise be possible. 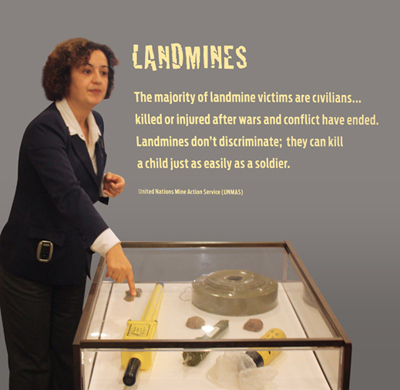 In this photo, a UN guide is explaining the instrument's function in eradicating the world of landmines. For more information on Schonstedt Instruments please visit www.schonstedt.com.